No, your eyes aren't deceiving you: this is a solid-body guitar with two f-holes! Why? Because it looks extremely cool, and looking extremely cool is the most important part of playing guitar! Facetiousness aside, the Wildwood team is incredibly proud to showcase the Airsonic for our exceptional customers, because it is truly rare and special. How special? Well, for starters, it's the first production model solid body guitar with f-holes! 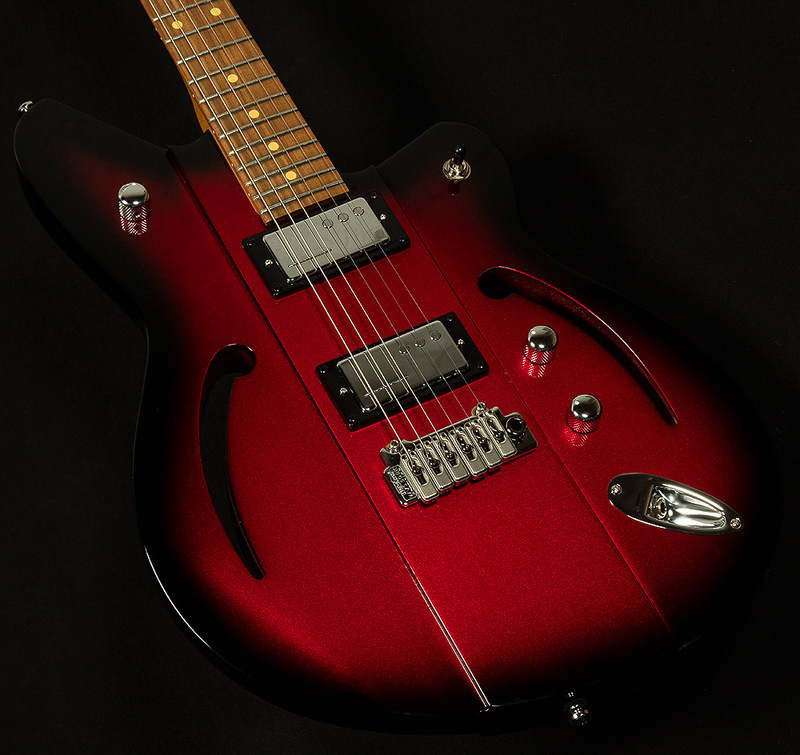 But, rest assured: the Reverend Airsonic is much more than a historical curiosity. The Airsonic is the first guitar I've ever played that sounds as rich as a great hollowbody but sustains like hefty solidbody. Like all Reverend solid-bodies, it has a resonant, lively korina body that produces a balanced, even sound that fits nicely in just about any musical context. The rest of the tone comes from Reverends Huevo/Nuevo 90 combo. These two pickups deliver big midrange punch, growling lows, and chiming highs, and with Reverend's signature bass contour knob, you can get every tone you need to get through a gig. When you combine that sound with Reverend's many player-friendly appointments like a Wilkinson tremolo, pin-lock tuners, a modern 12" radius, medium jumbo frets, and a comfy medium oval neck profile, you get a simple axe that can do it all in the studio or on the stage.